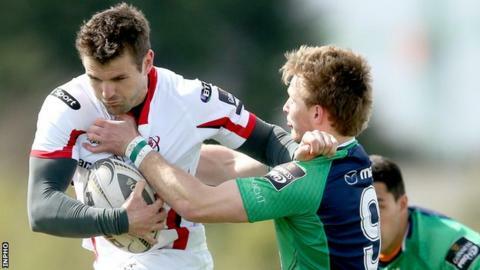 Ulster stayed on course for a place in the Pro12 play-offs and dented Connacht's European qualification hopes by winning an exciting game in Galway. Louis Ludik's try put Ulster ahead and scores from Tommy Bowe and Craig Gilroy extended the lead to 17-0 at the break as the visitors used a wind advantage. Matt Healy's reply gave Connacht hope as they cut the margin to 17-10. Bowe's second try and a Rory Best score left Ulster 27-13 ahead but they had to hang on after Tiernan O'Halloran's try. Connacht replacement Jack Carty had slotted a difficult conversion to leave only a converted try between the teams with nine minutes of play left. As Connacht produced intense late pressure, Robbie Henshaw's off-load appeared set to send in Danie Poolman for a 77th-minute try but the wing was unable to hold the pass as Connacht had to be content with a losing bonus point. With the Scarlets beating Zebre 28-26 in Italy, the bonus point keeps Connacht sixth in the Pro12 table with only the top six guaranteed a European Champions Cup place next season. Ulster's five tries also earned them a bonus point as they moved above Ospreys into second place in the table. Henshaw's Ireland centre partner Jared Payne helped set up Ludik's fifth-minute try by producing a break with the full-back brushing past Miah Nikora to score. Connacht's tactic of trying to hold on to possession against the wind worked well for most of the opening period. The home side thought they had levelled on 20 minutes after a spell of pressure but the television match official ruled that Ruan Pienaar had applied downward pressure on the ball before Connacht centre Bundee Aki had reached for the line. Connacht's good first-half work was undone in a three-minute period before half-time as Bowe ran in Ulster's second try after Aki had lost possession and Gilroy then waltzed through in the 35th minute. With Pienaar converting the third try, Connacht needed a fast start to the second half and Healy brushed off Chris Henry before charging over the Ulster line. Nikora's conversion was soon followed by three more points from the fly-half to cut Ulster's lead to 17-10, but Bowe's second try put further daylight between the teams as the visitors secured a bonus point. Replacement fly-half Carty cut Ulster's lead to nine points with a 63rd-minute penalty but the visitors mauled their way to a fifth try on 68 minutes with Best diving over. O'Halloran's 71st-minute try, superbly converted by Carty, set up an exciting finish with replacement full-back Darragh Leader's charge leading to a great late chance before Poolman spilled Henshaw's pass. Connacht: T O'Halloran; D Poolman, R Henshaw, B Aki, M Healy; M Nikora, K Marmion; D Buckley, T McCartney, R Ah You, Q Roux, A Muldowney, J Muldoon (capt), E Masterson, G Naoupu. Replacements: S Delahunt for Ah You 71, R Loughney for Buckley 68, F Bealham for McCartney 71, U Dillane for Roux 61, E McKeon for Naoupu 51, J Cooney for Marmion 68, J Carty for Nikora 61, D Leader for Aki 71. Ulster: L Ludik; T Bowe, J Payne, D Cave, C Gilroy; P Jackson, R Pienaar; C Black, R Best (capt), W Herbst, D Tuohy, F Van der Merwe, I Henderson, C Henry, R Wilson. Replacements: A Warwick for Black 71, B Ross for Herbst 66, R Diack for Henderson 66, I Humphreys for Cave 76, S McCloskey for Ludik 62.